Order one for each SC office and location to be fully compliant. The OSHA poster is included on the South Carolina Complete Labor Law Poster. When you order the South Carolina Complete Labor Law Poster, it will satisfy your State, Federal, and OSHA posting requirements with one poster. 06/2018 - Discrimination Notice Poster - Complete redesign which includes pregnancy as a protected class, new ways to report discrimination and additional EEOC requirements for housing and public accommodations. 06/2018 - Labor Law Abstract Poster - Minor grammatical and clerical changes. 06/2018 - Occupational Safety and Health Protection - Revised contact information to add a new phone number, e-mail and addresses for employers. 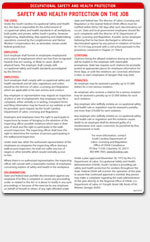 09/2011 - Payment of Wages Poster - Updated Labor Law Abstract portion, new guidelines/requirements given on E-Verify. 07/2010 - Labor Law Abstract Poster - Update made to content. 06/2018 - Equal Opportunity is the Law - Updated with more information on the federal financial assistance law, how the recipient of federal assistance must act, as well as revised contact information. 07/2016 - Discrimination Notice Poster - Minor update includes new address and website information. 07/2016 - Unemployment Insurance - Update includes the addition of a domestic violence clause in a possible eligibility reason. 10/2014 - Workers' Compensation - Updated with a new address and minor format and text revisions. 06/2014 - Equal Employment Opportunity - New South Carolina Equal Opportunity is the Law poster. 06/2014 - Unemployment Insurance - Updated with new department name, option to apply online, new website and new email. Many industries such as the restaurant, retail, construction, and professional use the South Carolina Complete Labor Law Poster to satisfy their compliance requirements for State, Federal, and OSHA. When posted in an area frequented by employees, the South Carolina Complete Labor Law Poster puts a business in full compliance. Federal contractors and subcontractors are required to display more postings in addition to the general State, Federal, and OSHA regulations. Please click here to see the federal contractor and subcontractor posting requirements. Ensure your full compliance by posting the South Carolina Complete Labor Law Posters with the federal contractor-required postings.